Back On Market/No Fault of Seller! 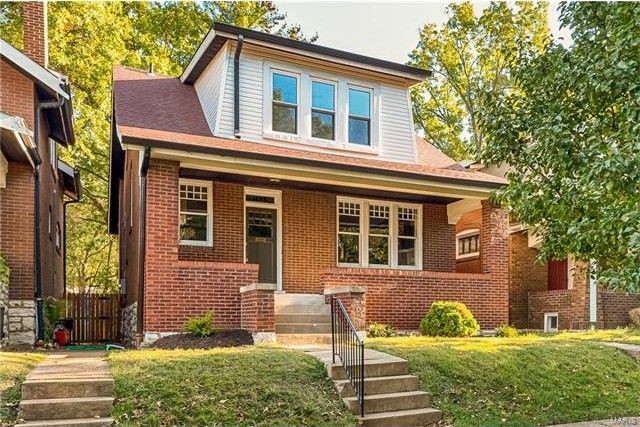 COMPLETELY RENOVATED 3-bed/2-bath, 1.5-story solid brick home with tons of historic charm over 1,500+SF of living space, located just a short walk to Carondelet Park! The elegant interior welcomes with a spacious foyer into an open 1st floor plan with beautifully preserved, original hardwood floors, historic woodwork & staircase, stained glass windows, wood-burning fireplace, built-in bookshelves & tons of natural light throughout! The gourmet eat-in kitchen boasts white shaker-style cabinets, new energy-star stainless appliances & stylish black granite countertops. 2nd floor highlights include hardwood in all bedrooms, spacious Master Bedroom with two closets and a cozy covered balcony off the back. The clean, dry walk-out basement leads to a huge, freshly painted 2-level rear deck, perfect for entertaining! Major System Upgrades include NEW HVAC SYSTEM, WATER HEATER, PLUMBING STACK, EL PANEL, ROOF, SIDING, WATER SUPPLY LINE & HOME WARRANTY in place! Directions: From Highway I-55 South, take Exit 203 towards Bates St. Turn right onto Bates, left onto Louisiana, right onto Dover Place. Home is on your right. From S Grand Blvd going south towards Carondelet Park, turn left onto Dover Pl. Home is on your left.